I am a two-year permanent transplant to Alabama. 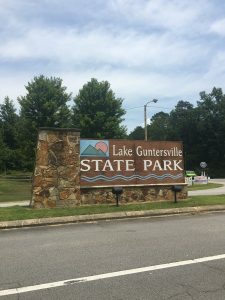 A semi-retired forester, applied ecologist, and former four-time university president, I am ever-more impressed with our Alabama State Parks. Count me among the many champions of our Alabama State Park System. 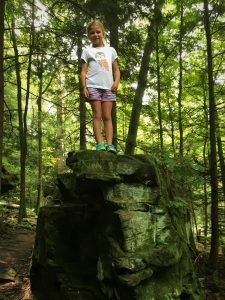 Although this post draws from visiting a State Park, this one is in Pennsylvania. 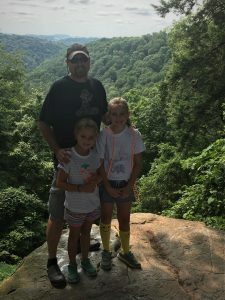 We visited McConnell’s Mill State Park mid-August. It’s about an hour north of Pittsburgh, and 30 minutes north of where our son and his family reside. 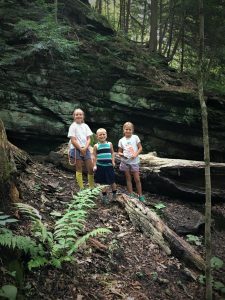 Our three Pennsylvania grand kids enjoyed the hike. 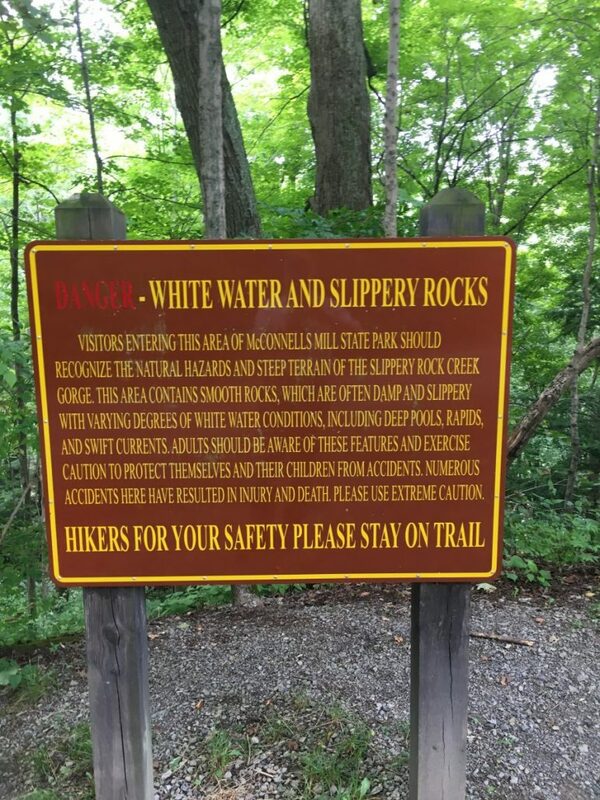 From the Park’s website: “McConnells Mill State Park, in Lawrence County, encompasses 2,546 acres of the spectacular Slippery Rock Creek Gorge, which is a National Natural Landmark. 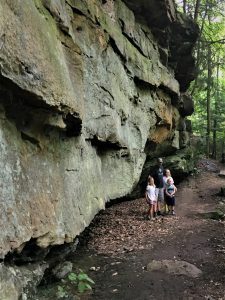 Created by the draining of glacial lakes thousands of years ago, the gorge has steep sides while the valley floor is littered with huge boulders. 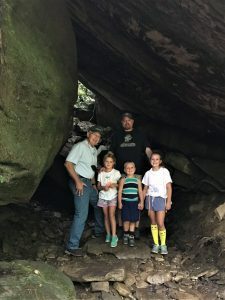 Scenic overlooks and waterfalls are popular natural attractions.” Located about 700 miles north of our local north-Alabama State Parks, the McConnell’s forest is clearly different. More hemlock and lots of black and yellow birch. 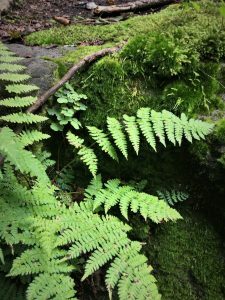 I had previously been to McConnell’s Mill, but this time I viewed it through my Alabama transplant lens. I drew a sigh of relief to see that our Alabama Parks do not fall short in any manner or comparative dimension. Is McConnell a treasure? Most assuredly, yes, yet so are our 22 Alabama gems! McConnell has no lodge nor marina, nor an interpretive center. In that regard, I swelled with Alabama State Parks pride. 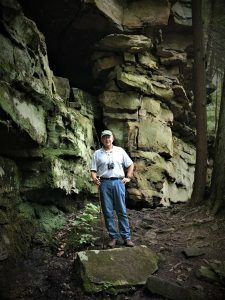 I will continue to visit our Alabama State Parks and as I do chronicle my observations and impressions through these Great Blue Heron Blog Posts. More (and more and more) to come! Yet I found the look and feel very similar. 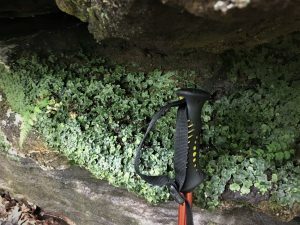 The amazing hemlock perched atop the exposed rock (lower left) is not unlike what I have encountered in our uplifted and eroded Cumberland Plateau. Precipitation in McConnell’s part of Pennsylvania is about 45 inches annually. That’s ten inches less than northern Alabama, yet the evapotranspiration difference probably equalizes the precipitation advantage we hold. The effective available soil moisture differs little. Winters are certainly more severe than Alabama’s. 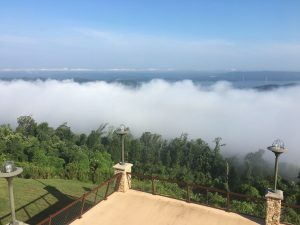 Exposed ledges (lower right) could be many places right here in Alabama’s Monte Sano State Park. 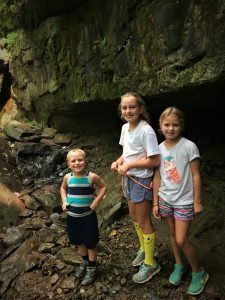 Finding refuge (and cooler air) among the ledges and boulders is an easy task, just as it can be here in the south. Note: I’m the old guy on the left! I’m convinced that kids everywhere like these outdoor adventures. As the photo (lower right) attests, so do kids of all ages — that’s the old guy again! Mallory couldn’t resist taking the high road. 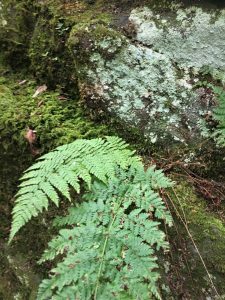 Rock ledges (whether in PA or AL) allow for strange bedfellows. That’s a hemlock and yellow birch linking arms. 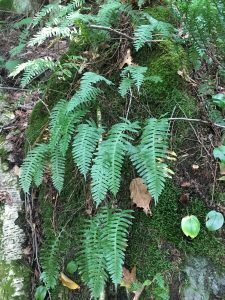 And like here, fern also tops the rock. 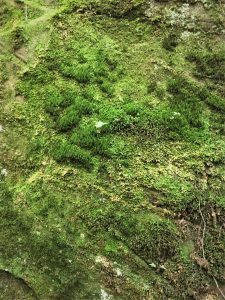 Moss and lichen find traction on rock surfaces both horizontal and vertical, as well as on the birch itself. Remember the old saw: Nature abhors a vacuum. The greater wisdom is that life-vacuums do not exist in Nature — at least not in these moist temperate climes. This canyon is one extended terrarium. Life is robust and ubiquitous. 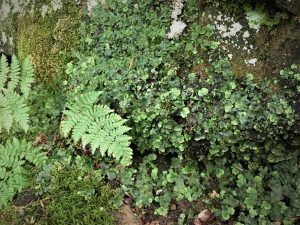 Christmas fern (left) and hay-scented (I believe) share custody of the rock with rich moss and some flowering plants. Anywhere my eye gazes presents natural works of art. As I’ve said many times, Nature’s beauty, magic, wonder, and awe lie within reach, hidden in plain view. Hidden that is, to those who fail to look, much less see. And I guarantee, for those willing to look and see, the aesthetic and spiritual rewards are many. I could have filled a gallery with masterpieces. The kids loved touching… an act permitted in this living museum. Touching… not plucking. A fact and rule the grands embraced and accepted with understanding and appreciation. 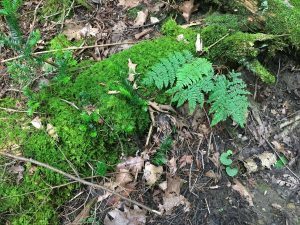 I particularly admired the mossy rock bordered on one side by a small yellow birch (below left). 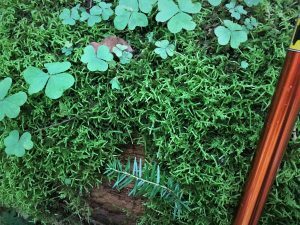 And who could not but be inspired by the moss living harmoniously with the tri-leaf wood sorrel and the tiny hemlock seedling (below right)! 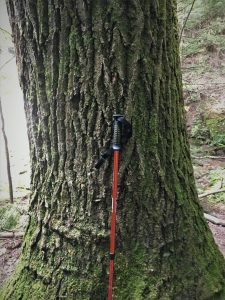 That’s my trekking pole to provide some sense of scale to the image. 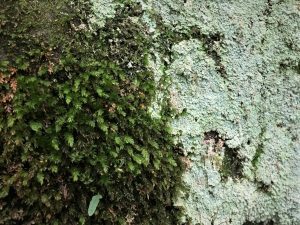 Or the side-by-side moss-lichen community (lower left) and the moss-lichen-fern triad (lower right)? Or these two dense lichen colonies adorning rock surfaces. I am smitten by the dendritic lichen (lower right). I know the trees; these non-flowering plants stymie me beyond their broad identity as one or another of the main groups. Yellow birch extends into northern Georgia. The species does not appear on the list of Alabama tree species. Therefore, what is a dominant species at McConnell is absent here in the south-land. Yellow birch is the most commercially valuable of the birch species. 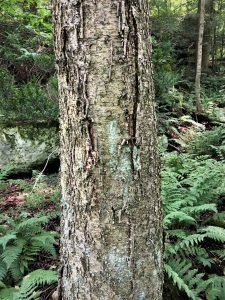 From a USDA online publication: “The wood of yellow birch is heavy, strong, close- grained, even-textured, and shows a wide color variation, from reddish brown to creamy white. It is used for furniture, cabinetry, charcoal, pulp, interior finish, veneer, tool handles, boxes, wooden-ware, and interior doors.” And I just love its textured yellowish barks! We do have hemlock here in northern Alabama. This individual at McConnell’s, like some I’ve seen right here at home, finds anchorage and sustenance while clinging to a rock ledge! Admire its tenacity and its algae-coated stem. We do have northern red oak here locally, along with southern red oak. This is northern; its southern cousin does not cross the Mason-Dixon line into Pennsylvania. This individual qualifies as a Mighty Oak — at least two-foot DBH (diameter breast height), 40-50 feet to the first branch, and nearly 100 feet tall. A grand specimen. Here’s a 30-inch diameter yellow poplar, another majestic specimen. The species is common from the Gulf into New York. We have some spectacular copses and individuals across our Alabama Park system. Here’s the same tree flanked by another yellow poplar perhaps 12-15 inches in diameter. An offspring? Perhaps. 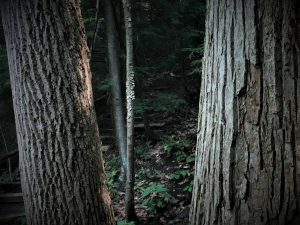 I present this photograph as evidence of the density of tree stems and the deep shade beyond these two. 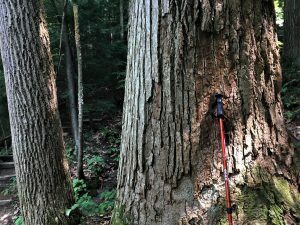 The story of this stand, however, is that when McConnell’s mill operated from 1852-1928, this forest likely saw clearcutting at least once for its original timber and then again for fuel-wood. 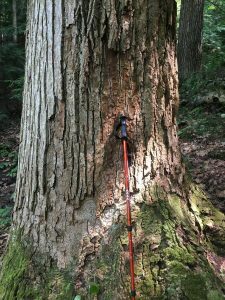 The Mighty Oak and the 30-inch poplar are most certainly second-growth. Forests are not static, just like all natural systems (human social and economic systems as well). The photo below enlarges the prior image to highlight the dead black birch (note the fungal fruiting bodies) between and beyond the poplars. My general rule of thumb is that these natural forests lose on average two percent of stocking (stems per acre is the usual metric) every year. This is natural stand development. 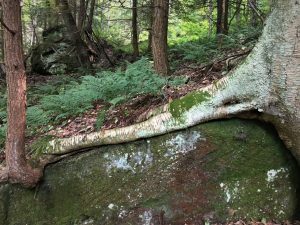 Some trees grow and flourish at the expense of others. Sounds just like business or athletics. Nature never fails to both inspire and humble. 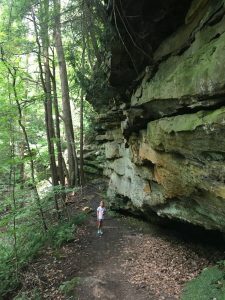 Time on our human scale means nothing to a sandstone gorge. We can only appreciate the beauty and feel the inspiration. Whether at Monte Sano or McConnell’s Mill, separated by 700 miles, Nature is elixir extraordinaire! 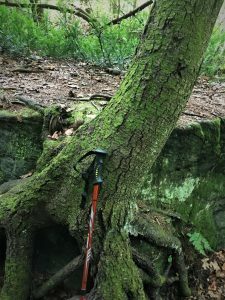 We also visited Cleland Overlook,all but near McConnell’s and providing a view of the Slippery Rock Creek gorge, completing the circuit from creek bottom, through the canyon, and then looking over the terrain. I’ve said before about other attraction, not Grand Canyon scale, yet still inspiring and worth the visit. Unless we set our sights so high that we’ll be satisfied or touched by all but the grandest, Nature offers more than we need no matter where we live. Our only requirement for fulfillment and appreciation of Nature is to open our eyes, look deeply, see what lies hidden with reach, and feel Nature’s passion and harness her wisdom and power. 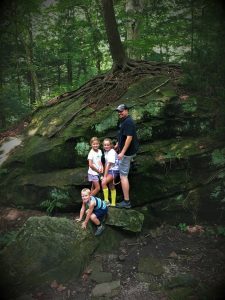 If you read last week’s Rainbow Mountain Blog Post (http://stevejonesgbh.com/2018/09/04/rainbow-mountain-hike/) about taking our Alabama grand kids to a nearby nature trail, you will recognize that I am offering very similar reflections and lessons from visiting this wonderful Pennsylvania State Park. 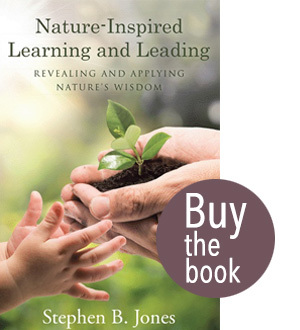 I want to spread the gospel of Nature-Inspired Learning. What better way than through the next generation. I believe some of my Nature’s inoculum may have found purchase. I’m hoping that awareness, appreciation, understanding, and accepting our obligation to care and steward will infect and inspire these three future Pennsylvania citizens. I will continue to expose them. Likewise, I will persevere in reaching listeners, readers, and potential believers of all ages. 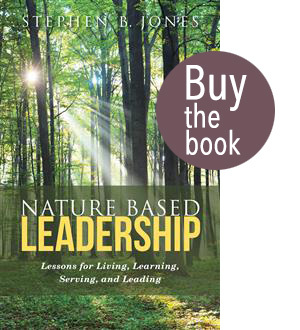 Allow me to repeat three Take Home Messages: first, Nature and Wildness are where you choose to find them! I’ll add to that this call to action. 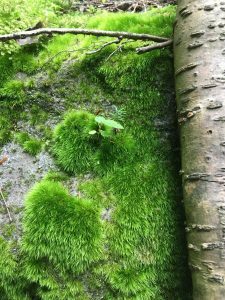 When you can introduce youngsters to Nature, I urge you to choose to find it near where they live… and take them into local wildness. Help them taste of Nature’s elixir. Help them catch the bug (both literally and metaphorically)! 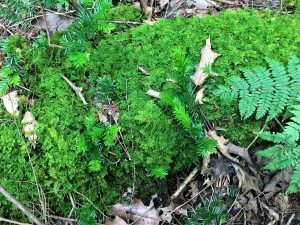 My second Take Home Message: Learn from the mosses and lichens. 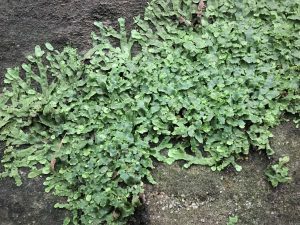 Understand that life finds a way of flourishing even when conditions seems harsh and uninviting. Know where and under what circumstances you flourish. Anticipate and prepare for adversity and episodic times of constraint and limitation. Adapt to the latter and always be prepared to reignite when the rough spells pass. Third, and my most urgent Take Home Message: Enjoy and cherish the Nature and wildness within reach. Find an Alabama State Park near you — visit and enjoy!